I took the Buy Homemade pledge this year, and outside of a few non-homemade items (like a gas gift card for Tommy), stuck with it. Actually, I only bought a few things -- I made most of the gifts myself. 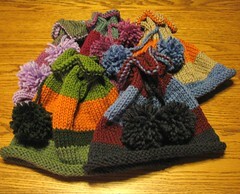 The hats (left) were for all the nieces (on my side of the family) -- the five of them range in age from 8 to 16. 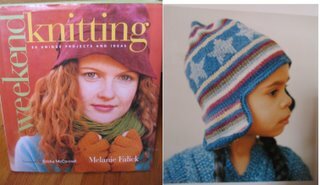 I love this hat pattern -- it fits everyone, it's fun, and can be personalized to go with different winter coats. We draw names for the adults on my side of the family and ended up with all the women. I made up packages for them with several handmade things -- earrings, patchwork scarves, etc. As always, it was a last-minute push to get everything completed. But it worked out in the end, as it always does. The only thing I didn't get done was a hat for Tommy. I hadn't promised it, but I know he's been wanting one for a while. It's the adult version of the Harry Potter baby hat from Weekend Knitting. He wants it simpler -- no stars and done in off-white, cream, and light yellow. I promised it would be the next thing I knitted... so it's on the needles now.... (or will be if I can finally find a size that fits the gauge).